Last Sunday night I hosted by first twitter chat, through the Parent Bloggers Network #pbloggers. It’s a weekly chat for parent bloggers, lasting an hour between 9-10pm and each week a different topic is set for discussion. 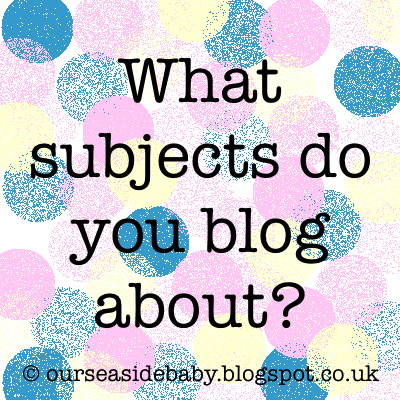 I chose to focus on blogging subjects. It’s quite an insightful area to know what other bloggers write about, how they choose their subjects, how much people reveal on their blogs and which, if any, subjects are avoided. On a personal level I have been blogging for nearly six months now. This is my first and only blog. It’s been a wonderful experience so far. I’m still learning a lot but blogging has opened lots of doors and I hope it continues to open many more. I write about a variety of subjects that include bringing up my 21 month baby boy, days out, recipes, reviews, photography and opinion pieces such as whether to blog anonymously. I don’t really plan what topics to focus on but I have lots of different interests and ideas in my mind and I suppose, to a certain extent, that is reflected in this blog. However, I have noticed that some subjects which I am passionate about haven’t been covered in detail such as breastfeeding and political views. I don’t think I’m necessarily avoiding these subjects, I hope to get round to writing about them at some point, I just seem to be able to put toddler related posts together quickly. Or maybe these posts are just easier to write, without the knowledge that someone might disagree or take offence. I was keen to see what other bloggers thought. How do you decide what to write/blog about? Do you focus on particular subjects or do you write about everything? Laura Green @Loz83T I take inspiration from an experience or photo taken...I often deviate but that's my start point! Lisa Cornwell @mummascribbles most of the time it's something that has happened that day! I don't have many posts planned ahead! My next question was: Are there any subjects you avoid blogging about? For example, personal stories or strong political views? WhereIsMyMind? @saraWIMM I haven't avoided anything so far, it's my blog I write for me so if there is something on my mind I write! mamavsteacher @mamavsteacher Stay away from politics and weirdly education... I have my opinions but I don't fancy debating them particularly as a teacher, there's too much at stake for me to air my views online! Lisa Cornwell @mummascribbles I try to steer clear of politics! I have my opinions but don't need a war of words on my blog! Amie Madgett @mrpbabyandme I wanted to do some writing about cosleeping as we have dabbled. But too scared as so controversial! Dad Without A Map @Dad_Map I avoid anything i know will inflame people. I like to express my opinion but I don't want to be Katie Hopkins! Raising the Rings @RaisingtheRings Thought about a 2nd blog just to be able to vent anon without feeling watched! It was great to see a real mix of opinions. Some bloggers choose to treat their blog like a diary and write about anything whereas others will steer clear of politics because, for example, of implications from work or family. Some bloggers want to focus on certain subjects, they might be therapeutic to write about and share whereas others stay away from sensitive issues. Of course, this doesn't apply to just the blogging world. Every day in our conversations we choose what to reveal, what we want to share with people, how much we want to talk about particular areas and how there are certain things we might want to keep to ourselves. Each blog reflects the personality of the writer, their creatively, their passions or their feelings or thoughts on certain subjects. That's the wonderful thing about blogging, there are no rules, we write what we choose to write about. Just writing this post has actually made me eager to write about lots of areas I haven't previously discussed or have been meaning to but never find the time! If you're a blogger what do you write about? Is there anything you avoid? Or have you benefited from sharing certain stories? Do you share these things in 'real life' too or only on your blog? I'd love to hear your views. Please comment below, on my Facebook page or tweet me.